Improved NAEP Data Explorer Now Available Create accounts, custom tables, charts, maps and reports for current NAEP results. Digest of Education Statistics The 51st edition of the Digest contains statistics about every level of education, from prekindergarten to graduate school. 2017 NAEP Mathematics & Reading Assessment See how fourth- and eighth-graders across the country performed on the NAEP mathematics and reading assessments. Find the Right College for You Use College Navigator to search and compare information about postsecondary institutions across the country. Your School and District at a Glance The School and District Navigator makes it easy to view and compare information about your district or school. Persistence, Retention, and Degree Attainment Among 2011–12 First-Time Beginning Postsecondary Students as of Spring 2017. The Condition of Education is an annual report to Congress summarizing important developments and trends in the U.S. education system. The report presents 50 indicators on topics ranging from prekindergarten through postsecondary education, as well as labor force outcomes and international comparisons. 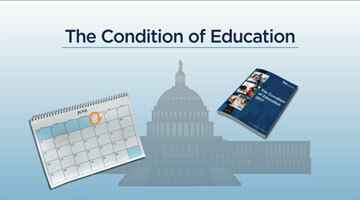 Discover how you can use the Condition of Education to stay informed about the latest education data. The U.S. PIRLS overall average reading score of fourth-grade students was 549. This score was higher than the PIRLS scale centerpoint, which is set at 500 points. Browse key indicators on the condition of education in the United States at all levels, from prekindergarten through postsecondary, as well as labor force outcomes and international comparisons. The indicators summarize important developments and trends using the latest statistics, which are updated throughout the year as new data become available.